As we’ve discussed, the sequestration enacted March 1 cut federal spending by $85.3 billion for fiscal year 2013. The sequester not only cut money allocated to federal programs, but also meant reductions for federal spending at the state and local level. States and local governments depend on federal grants and loans to fund essential services and programs, helping them maintain infrastructure, provide education, administer health and social services and ensure public safety. In 2011, federal grants to states and localities totaled $607 billion and accounted for approximately 25 percent of state and local government spending. A report released by EPI last week finds that the sequestration decreased federal funding for state grants by $5.1 billion in the 2013 fiscal year. Although the March 1 sequester reduced federal grant spending to all states (relative to the continuing resolution federal grant spending already in place), some states were impacted more than others, ranging from a 0.68 percent cut in Tennessee, to a 3.36 percent cut in Wyoming (see Table 1 in the paper). Following sequestration, the current continuing resolution was signed into law on March 26—less than a month after the budget sequestration began—setting funding levels for the remainder of the fiscal year, and thus impacting grant funding to programs at the state level. 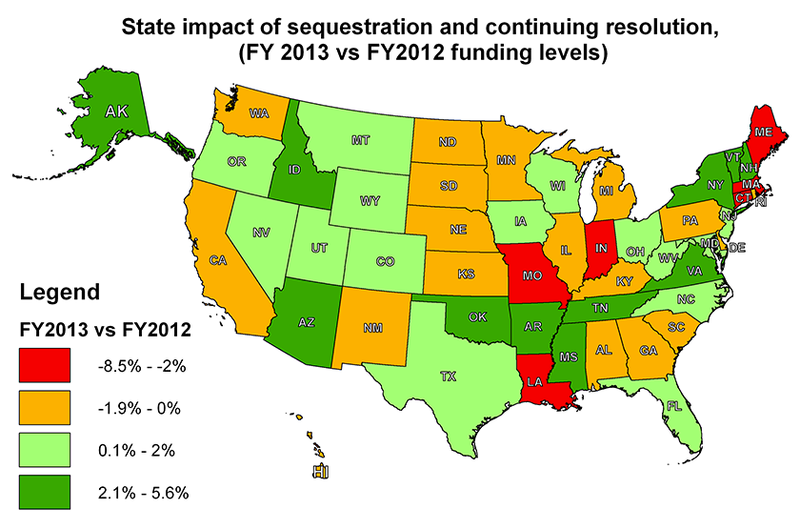 The map below illustrates the changes in each state’s fiscal 2013 federal grant funding, compared to fiscal 2012 federal grant spending, as a result of sequestration and funding levels in the current continuing resolution. Differences in how grant funding is distributed are dependent both on how programs function as well as which states participate in programs funded by federal grant money. After accounting for both sequestration and the current continuing resolution, grant funding for 26 states is estimated to increase, while grant funding for the remaining 25 states (including the District of Columbia) is estimated to decrease. State and local governments were already suffering as a result of the Great Recession, threatening both state and national economic recoveries. Many of these governments rely more than ever on federal aid to both shore up budgetary shortfalls and provide necessary services to residents. Sequestration and the current continuing resolution will force many states to make difficult choices while looking to both balance their books and maintain services for their citizens.